If he’s not yet ready to throw, than could #7 possibly play during wildcat situations? Injury update in Philly: Eagles head coach Andy Reid has come out and said LT Jason Peters will undergo a minor knee surgery and Broderick Bunkley will acutally attempt to suit up with an injured elbow. 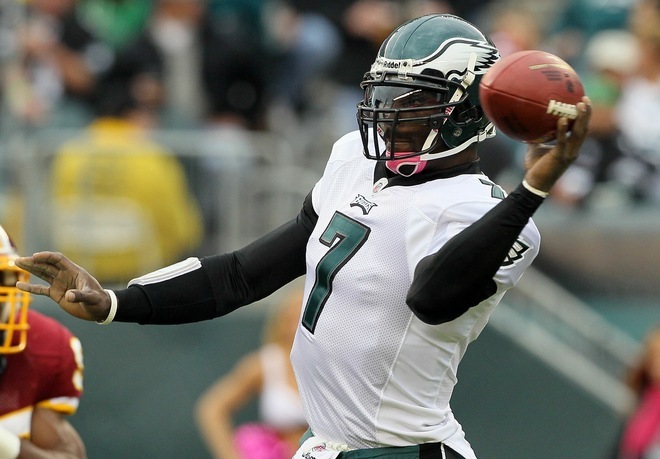 As for Vick, he is still recovering from the rib injury he suffered two weeks ago at home against McNabb’s Redskins, however, he is not yet ready to throw the football. With Peters, he will have orthoscopic surgery performed on Thursday and will now be sidelined for the Falcons’ game. His status for the Titans in two weeks has yet to be determined. While Vick is getting better from his cartlage tear, he is lifting weights, which is encouraging. Broderick Bunkley’s plan is now to rehab his elbow injury and elude a surgery that would end his season. He is working with Eagles’ doctors and the infamous specialist Dr. James Andrews. Also, WR Riley Cooper and CB Asante Samuel have been cleared to practice and both are expected to participate on Sunday against Atlanta. The pair missed the game in San Francisco due to concussions suffered against Washington. Crazy turn of events: Reid said Bunkley was more than likely out for the 2010 season after getting injured in the Eagles victory over the 49ers. From out for the season, to bypassing surgery, to playing this Sunday against the Falcons. Talk about sidestepping a potential lost season. Excellent news for the city of Brotherly Love, Rocky, and cheese steaks.